Chris Townsend Outdoors: A Last Taste of Winter? June and still waiting for the summer to start, the wintry weather having continued through May and into the new month. The last weekend of May I went out anyway, hoping for sunshine but expecting rain and cold and maybe snow. Late afternoon I set off down Glen Feshie in a cold wind that brought frequent heavy showers of icy rain. The clouds were low over the hills, sometimes tendrils drifted down to the highest trees. Just briefly I had glimpses of the summits, white with fresh snow. 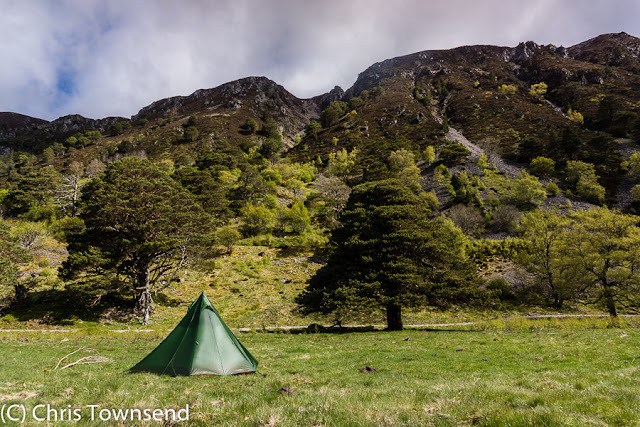 I camped at dusk, eager to get under cover and into my warm sleeping bag. The night was stormy with gusts of wind and bursts of rain hitting the tent. The temperature fell close to freezing. 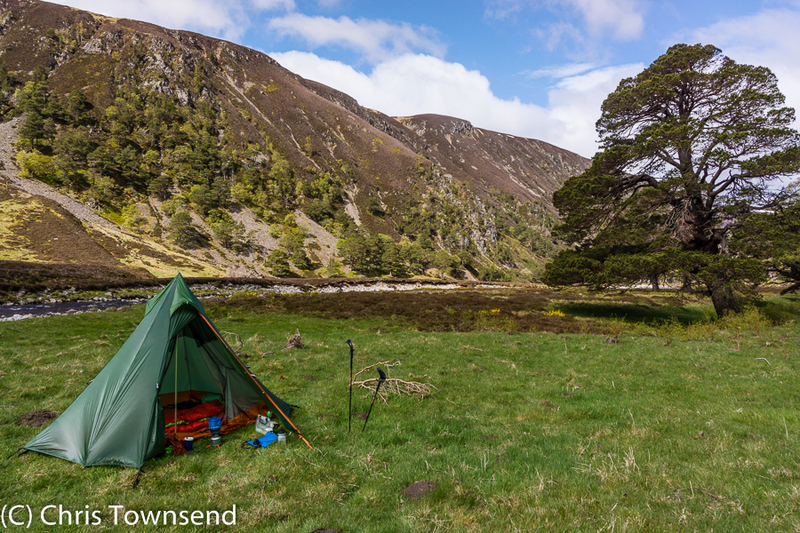 The weather calmed as the sun rose however and Glen Feshie was bathed in sunlight and the sky above was blue. I wandered round camp looking at the fresh green leaves on the trees and the scattering of woodland flowers - primroses, dog violets, wood sorrell. The sunshine lasted only a few hours. By the time I set off dark clouds were covering the sky, driven by a cold north-west wind. The last birch trees were bright with spring colour but otherwise the landscape was dark and brown and grey. Leaving the glen I climbed steep heathery slopes to the open vastness of the Moine Mhor plateau. The wind here was bitter, gloves, hat, fleece, hood were all necessary and I kept moving, there being little shelter. I crossed the wind blasted summit of Mullach Clach a'Bhlair, spattered with fresh snow, and headed towards the distant pointed peak of Sgor Gaoith. Across the plateau Braeriach, Sgor an Lochain Uaine and Cairn Toul came and went in the clouds. Huge drifts of old snow lay on every north and east facing slope, however gentle. I crossed several. The snow was firm enough to support my weight. It won't be thawing quickly. 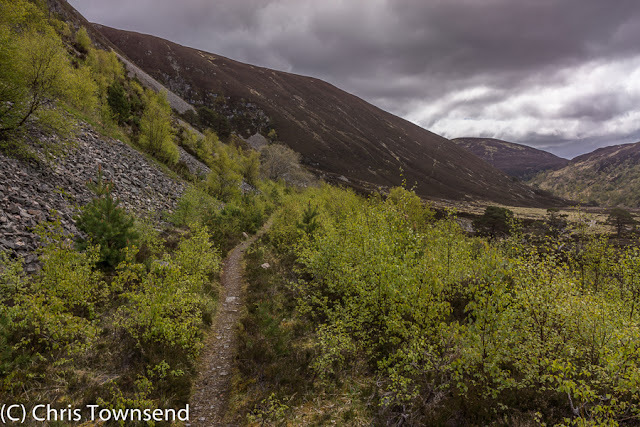 Turning away from the Moine Mhor I descended over the shoulder of Carn Ban Mor and back to Glen Feshie. Out to the west snowy hills stretched out under the raging clouds. 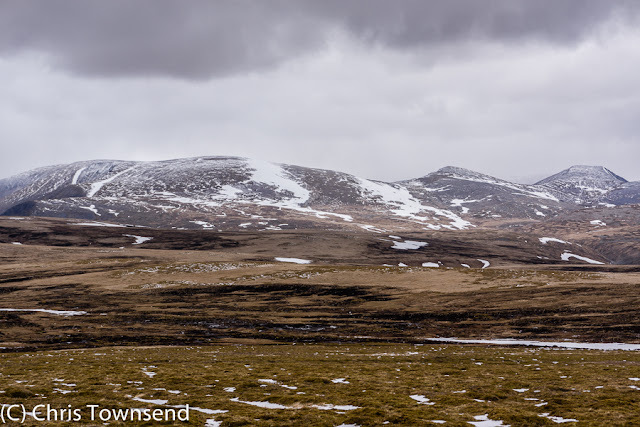 Hi Chris, We were up in Kingussie last week and were amazed at the amount of snow still lying on the northern corries, but also further south around Drumochter and Ben Alder. It meant the south-westerly winds (usually a bit milder) had invariably picked up a bit of bite by the time they reached us. 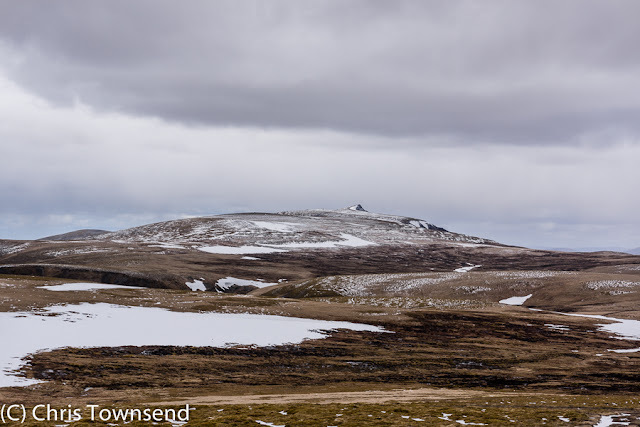 There was a new overnight dusting on Cairn Gorm on one of the days last week, clearly visible from Glenmore; I think it was wednesday going into thursday. 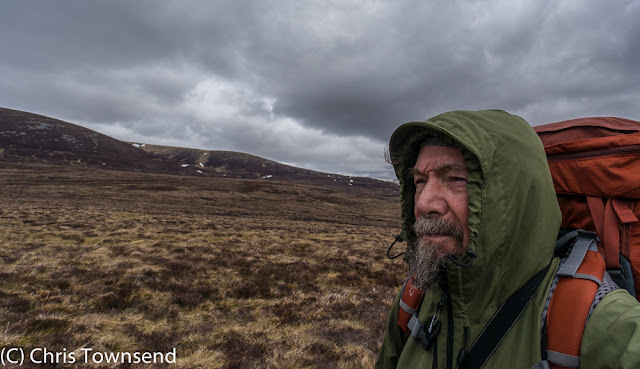 On Wednesday, after climbing Carn an Fhreiceadain I crossed the Newtonmore Munros in rain, hail, wind and finally snow. The weather originally forecast for Thursday came early! Not even spring-like never mind summer, hopefully better weather will arrive soon. Is that a MLD Solo-Mid in photo -- or something else? How did the Wickyup perform in these stormy conditions? Would you recommend using it under these circumstances? It performed fine and is certainly suitable for stormy weather.